This exclusive mixer is only available to buy by contacting us on the phone, by email or in store. MODEL 1 is a performance instrument providing new creative possibilities to artists, and empowering them to PLAYdifferently. 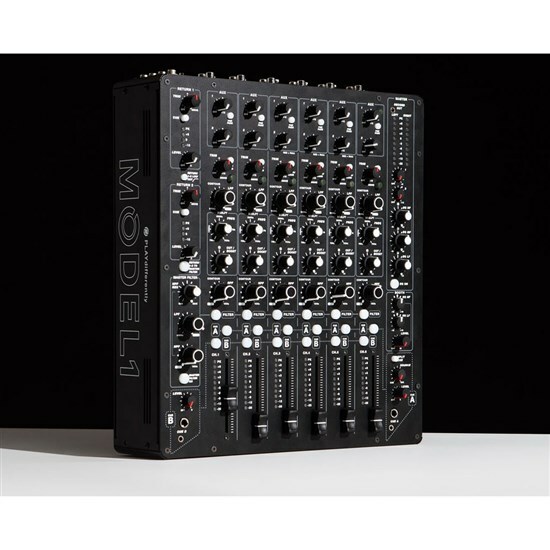 A mixer of uncompromising build quality, intuitive tactile controls and beautifully warm analog circuitry, MODEL 1 is engineered by Andy Rigby-Jones and co-designed by Richie Hawtin, with two years of testing, insight and refinement with artists, clubs and engineers from across the electronic music community. 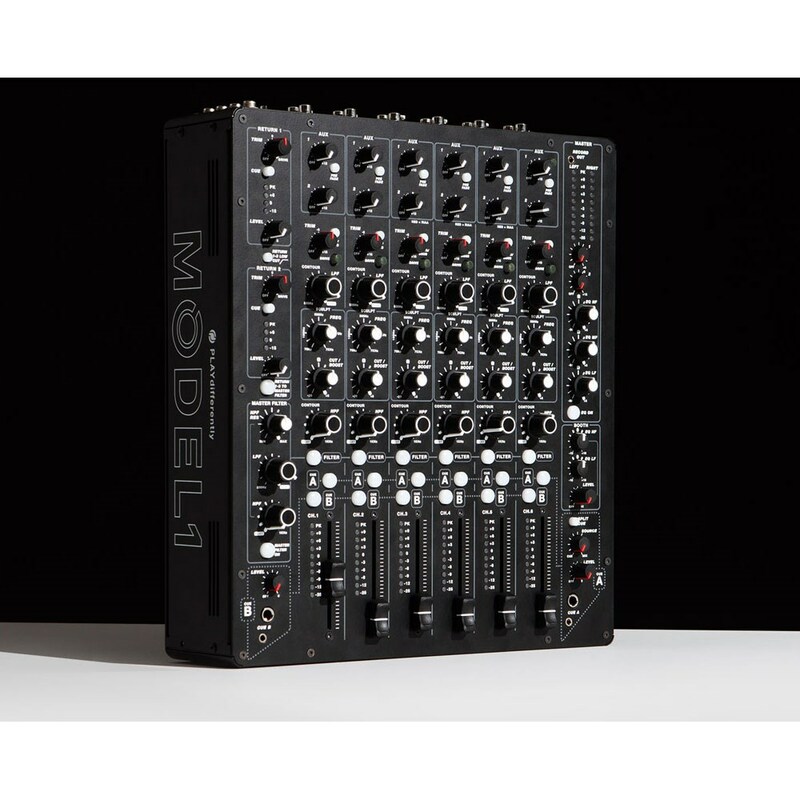 MODEL 1 has a unique offering of six fully featured input channels plus two stereo returns in a small format frame. 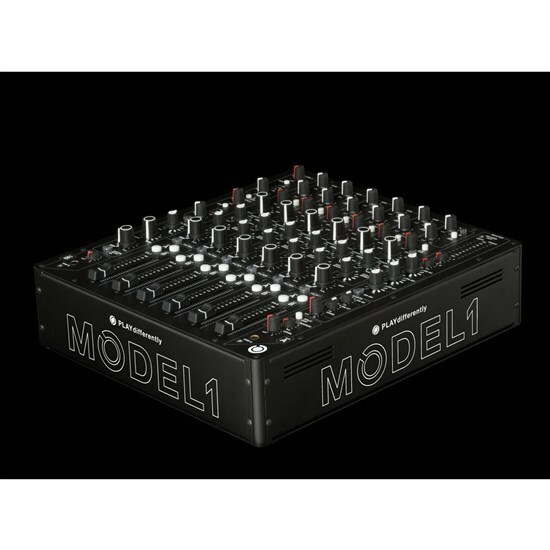 It has many features not currently available on any comparable device, such as Input pre-amplifier drive control, hybrid filter/swept bell EQ, dual cue system, dual mixer linking system, and a fully balanced Tascam DB25 connector system. 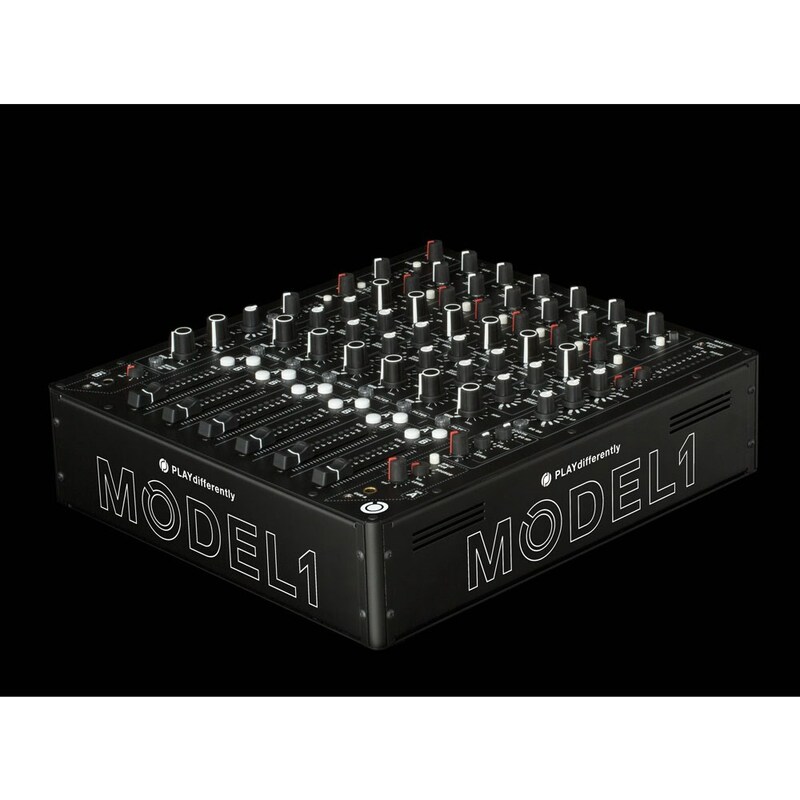 MODEL 1 is a purely analogue mixer featuring technology normally found in the finest studio consoles, such as a fully balanced mix buss, zero crossing detection for seamless filter & master EQ routing along high voltage differential power rails. The two AUX controls send the channel signal to the Aux mix outputs for use with external effects processors or, in some applications, local monitors. AUX 1 offers either PRE or POST FADE while AUX 2 is internally set to post fader. Two basic stereo channels for use as return inputs from external effects processors or other sources. Each return features TRIM to adjust the return signal, input DRIVE circuit, and CUE routing to both Cue A and Cue B. 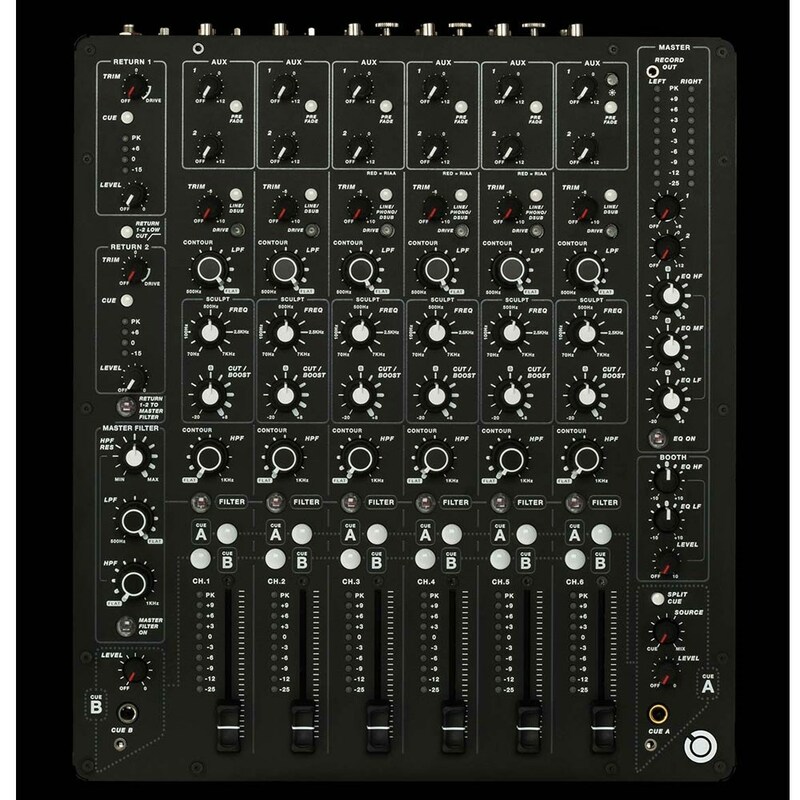 Each Return also feature Metering for visual feedback of the signal level, a rotary LEVEL fader to adjust Mix amount and combined Return 1-2 Low Cut EQ and Master Filter routing. 3 high performance turntable inputs, optimized for the club environment in order to minimise the tonal imbalance between vinyl and Digital audio, and to eliminate sub frequency feedback. Each phono input has it's own Individual Turntable Earth Binding for greater flexibility. Custom TKD 60mm faders. These twin rails faders have been carefully chosen to ensure long life and smooth operation and feature a heavy feel for greater precision. SCULPT is a semi-parametric swept bell filter, and consist of two controls,FREQ which sets the centre frequency and CUT/BOOST which adjust the gain or a attenuation at this frequency. The level of cut/boost is asymmetric; maximum boost is limited to +8dB, while the cut is extended to -20dB. 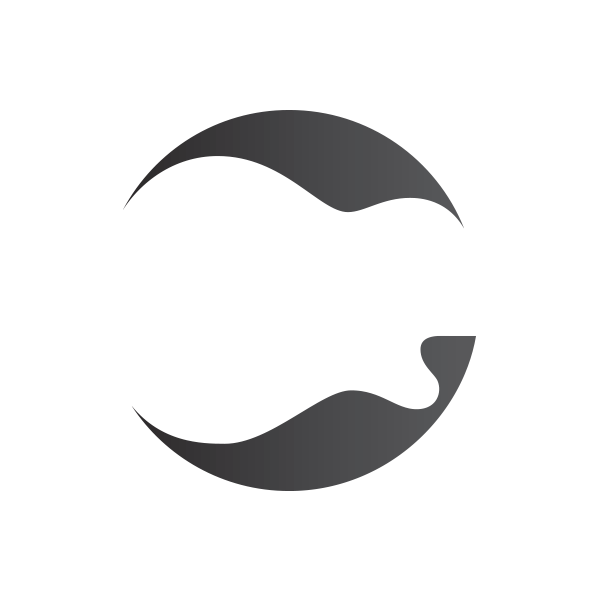 Sculpt has a wide Q and a frequency range that covers almost seven octaves. As the name implies these two controls allow you to “contour” the frequency range of the audio signal. They consist of low Q, High-Pass and Low-Pass filters designed not to add colour to the sound as they are swept across their frequency range. A unique feature on every input, the DRIVE control. This control allows the user to adjust the level at which the channel pre-amplifier clips the input signal, thus creating harmonic distortion as a creative effect. Two independent Cue systems, A and B. Cue A routes to the right hand side headphone monitor and the Cue B routes to the left hand headphone monitor. The DualCue system makes it much easier for two DJs to perform on the mixer together in "Back2Back" setups, as each can select a separate channel to monitor without interfering with the other. This feature also assists DJ's handing off to each other in a smooth and natural way. A system that allows multiple mixers to be linked together, either for use with two or more performers, or as a way to expand the number of channels. When Linked together the mixers share a common balanced mix feeding the PA and Booth monitors. In addition, the two Cue systems are joined allowing interactive cueing between multiple performers. 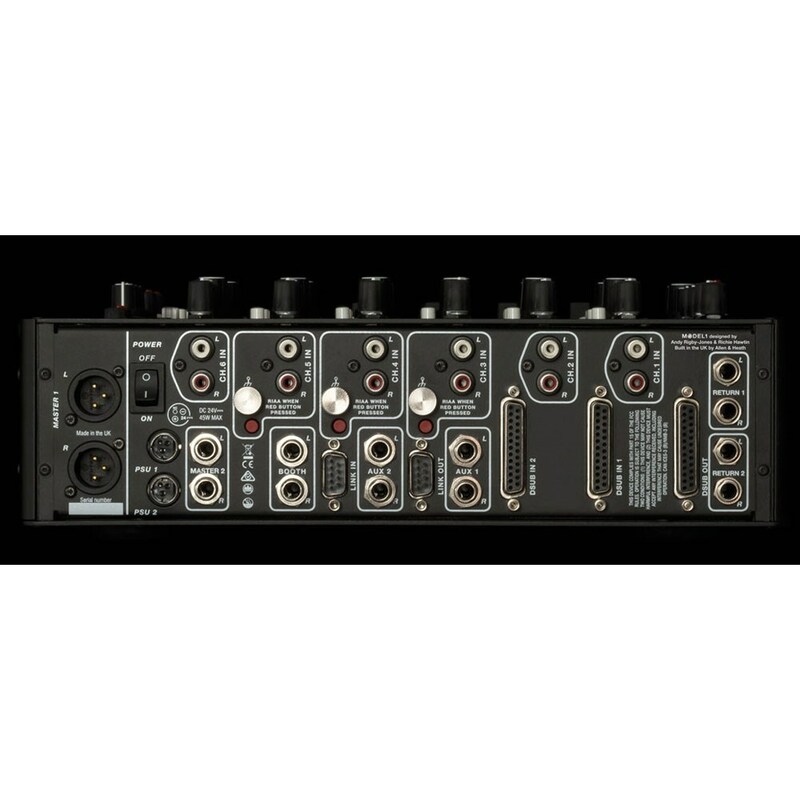 Fully balanced main mix bus (usually only found in very high end analogue studio consoles) – resulting in >110dB of dynamic range, improved hum rejection, lower noise and crosstalk. The Master Filter consists of a High-Pass Filter (HPF), a Low-Pass Filter (LPF), and a resonance control (RES) to adjust the sharpness of the High-Pass filter. The Master Filter can be used as a swept frequency performance effect, or as pre-set frequency mix tool to instantly cut the Low or High frequencies of any channel routed to the Filter. Signals can be routed to the MF by the Filter select switch found on each channel. Three-Band Master EQ with asymmetric cut and boost, -20/+6dB which can be used as a performance affect, as well as a frequency correction tool. A 2-Band equaliser allowing the user to adjust the frequency response of the Booth monitors to suit their own preference. Smooth intuitive controls matched with warm pure analogue circuitry. All internal routing utilizes our zero-crossing detection system that helps minimize audio switching artifacts for channel filter selection, master filter on/off and master eq on/off. This system allows each of these functions to be used quickly and intuitively as performance effects. Beautifully smooth components each controlling one specific function for intuitive on-the-fly creative performances. Powered by an external 90W 24V universal voltage PSU. Internally, the 24 volts from the external supply, is converted to just under +/- 20V for the analogue power rails by using high frequency switching technology, giving MODEL 1 some of the highest signal headroom of any professional mixer, irrespective of its application. MODEL 1 offers the utility of powering with dual supplies. This feature - found on premium live sound and recording consoles - can offer greater security by powering the mixer simultaneously with a second supply. In scenarios such as music festivals, each supply can be powered from separate mains phases. In the event of one phase going down the other supply will automatically take over powering the mixer. Built in the UK with our partners DigiCo and Allen & Heath using alloy/steel chassis for maximum strength and minimum weight optimised for touring, club and performance situations. Two fully balanced TASCAM DB25 inputs receiving all 8 Stereo channels for rapid connections to external soundcards and added flexibility in club installs. Fully balanced TASCAM DB25 output for sending Master, Aux 1 & 2 Sends and Cue B channels down a single connector for rapid connections to external soundcards and added flexibility in club installs. Mounted on the front panel at the top of the Master section the RECORD OUT - 3.5mm TRS Jack socket feeds the post Master EQ signal as a pre- fader record output. Nominal level is –2dB.